At the Milan event last month I had my final fitting on the cashmere herringbone jacket being made by Ferdinando Caraceni. The more I get to know Nicoletta – Ferdinando’s daughter, although not a cutter unlike her father – the more impressed I am by her. Her passion for the work, particularly in her father’s memory, is infectious, and it reignites in me an interest in the details of finishing and stitching. She demonstrates the finer points of a cotton double-breasted jacket, the delicate finishing of the internal seams. She scrunches up her own, 50-year-old jacket, and expands it again, to demonstrate the lightness and springy nature of the wool and canvas combined. It is, as I say, infectious. The Caraceni atelier is also worth visiting for its collection of cloth, which stretches around two walls of the big central room. Ferdinando had a particular fondness for heavy Irish linens and heavier Huddersfield worsteds, and there are some wonderful examples in there from both mills and merchants now gone. Interestingly, given our recent discussion of China and its increasingly inquisitive rich, Nicoletta said that she had a visit from a group of Chinese recently who were fascinated by the bespoke process and the various types of cloth. 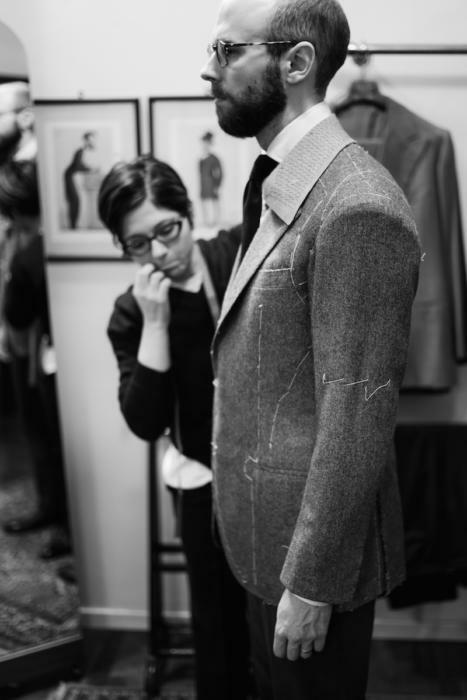 Unfortunately, they understood the process but not the length of time required to make a suit. So having discovered that there would have to be repeat visits, they left without commissioning anything. A little knowledge, but not quite enough. 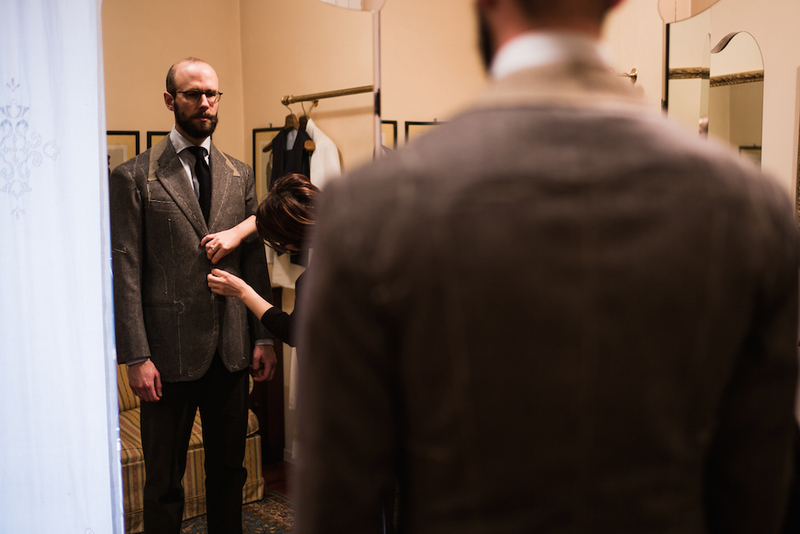 The fitting itself was great – just a few tweaks here and there. I particularly like the impression of structure the jacket gives, without much actual weight to the canvas or padding. The look is less similar to Neapolitan jackets than I expected – this will not be casual enough to wear with denim – but it is just as light and yet smart and sharp. The cut of the jacket is an object lesson in how to achieve a flattering line through the waist, yet allow plenty of room for comfort. The key is to shape the front but leave a little room in the back. The side profile isn’t be quite as sleek through the small of one’s back, but it is the front that most of us care about most, and in my case I need that extra room to prevent the jacket kicking out over the seat anyway. 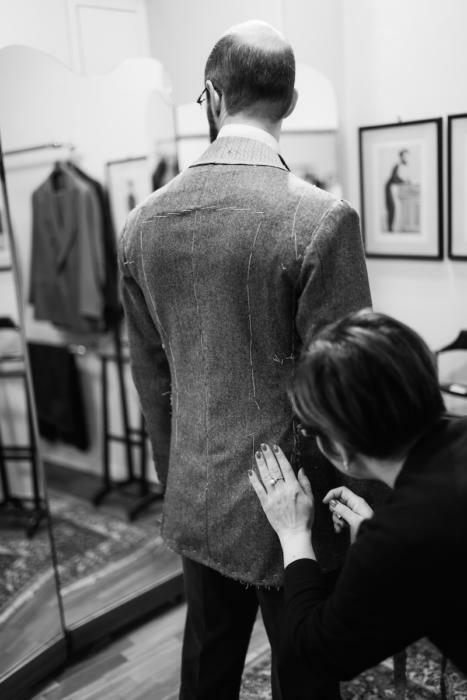 You can follow the discussion on Herringbone jacket fitting – Ferdinando Caraceni by entering your email address in the box below. You will then receive an email every time a new comment is added. These will also contain a link to a page where you can stop the alerts, and remove all of your related data from the site. Beautiful work so far (thanks for the detailed shots), especially fine on the back and shoulders. Could you give some more detail as to the shoulder construction; the softer sleeve head blends with a more fitted upper chest area – something quite hard to achieve. I take it that have you gone for double vs. no vents on the back? Hey. Slim shoulder pad with no roping; a natural line but regular shoulder construction make it that tad more formal. I’ll be very interested to see how this turns out. I very nearly went for this shoulder on a recent order. But got scared by my sloping shoulders and retreated to a roped approach. I find it quite hard to hit the right balance of formality in odd jackets because my sloping shoulders really don’t suit a Neapolitan approach. I’ll look forward the the final shots. I noticed and like Caraceni sleeve heads, it looks wide but not high (no rope I guess). What makes that it can look wide and hold: is the arm sitting right under it and supporting it, is the shoulder padding extending into the sleeve head,…? I have been doing my research for a long time now and F. Caraceni has always been at or very near the top of my ‘ let’s go bespoke’ list. 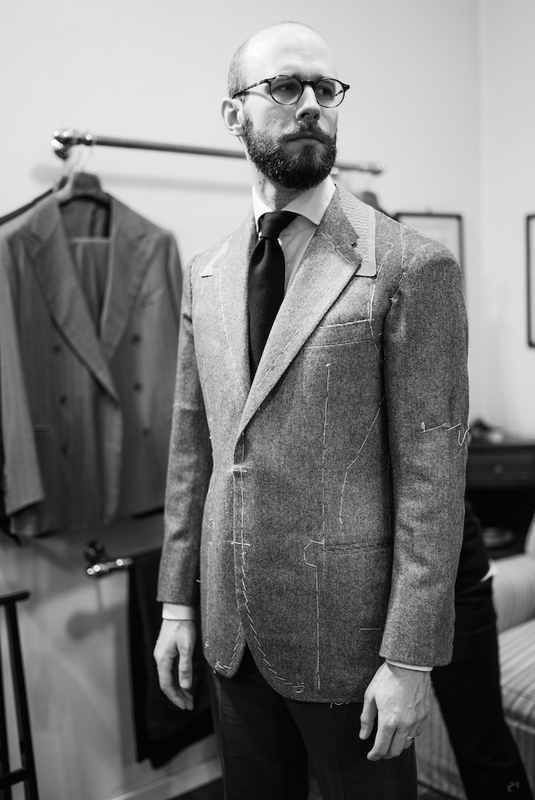 In particular, I love the line of this jacket – it has that sublime ‘touch’ that makes such classic Italian tailoring irresistible. Was the styling/ length etc your request or is this Caraceni’s house style? IMO, the best piece you’ve gotten (and posted) thus far. Looks great! Simon, I see you’re wearing a higher shirt collar here. So much better for a long neck, don’t you think? Less comfortable maybe, but it looks great on you. Joe Morgan influenced me in that regard back in the day. The reputation of Ferdinando Caraceni was a bit tarnished because the firm the double breasted suits for Silvio Berlusconi,that were with a lot of padding in the shoulders and rather boxy (in Italy were called “reinforced concrete suit”). 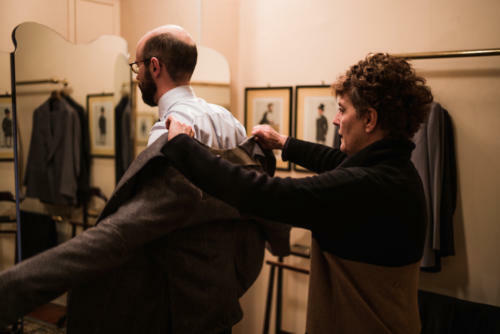 I’m surprised by the pleasantness of the silhouette of Ferdinando Caraceni’s suits,neither “boxy” or “dull”. Mr.Berlusconi jackets have almost no padding in the shoulders. The problem is that his shoulders are very large and very straight.